J&M Machine Products designs dedicated work cells for our higher volume projects. Depending on the volume and complexity. We will determine the most efficient means to produce the parts. We have the option to either utilize our state-of-the-art robotics equipment or have one operator run multiple machines. J&M has 6 robotic cells which feature robots with the capability of loading and unloading parts up to 100 pounds. 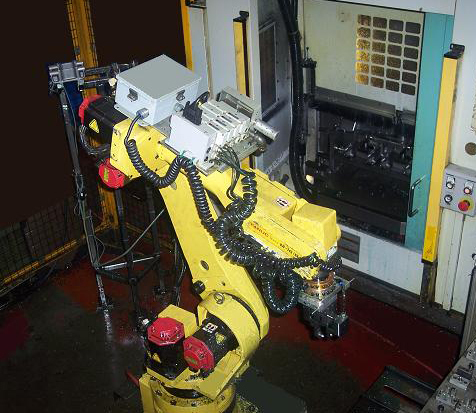 These robotic cells can feed either CNC lathes or CNC Machining centers. Our dedicated cells can handle volumes up to 500,000 pieces per year, but can also be utilized in volumes in the 20,000 - 60,000 EAU range. We will utilize any combination of our CNC machines to create these cells. All in all, J&M's robotics technology offers customers superb craftsmanship and quality, lower cost and faster turn-around time.